A lawyer may be superb at cross-examination but may not necessarily excel at writing legal copy. 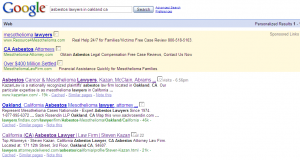 Some law firms outsource their legal copy writing to companies who understand what constitutes success on the Internet and how to attract new clients to these law firms. If outsourcing is not in the budget or if a law firm or solo practitioner wants to create their own web copy, certain fundamental rules must be followed. Posted by dave on Thursday, September 9th, 2010 at 5:37 pm and is filed under seo. You can follow any responses to this entry through the RSS 2.0 feed. You can leave a response, or trackback from your own site. 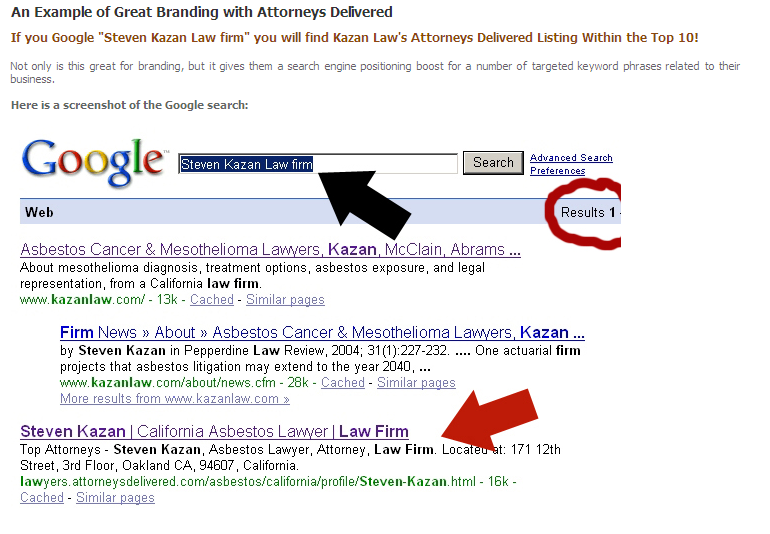 I found a pretty good article on law.com about the value of search engine optimization for lawyers. I basically agree with all of the key points and the overall theme that SEO done well can have tremendous value for law firms, or any small business. And the specific SEO techniques and advice are all on the money. The author doesn’t appear to be a subject matter expert herself, but did some decent research, and interviewed a talented SEO guy, Brad Fallon. She also cited top notch SEO resources like webmasterworld, seomoz, and Aaron Wall’s seobook. The issue I do have is with the “hook” of the article, the story of the legal secretary who fixed the company website and launched it to the top of google in 7 days, and saved the busness and her job. I’m not saying that it didn’t happen – it’s certainly possible – but if it is true, then there was a lot more going on then just some research and hard work by an amateur. It is not realistic to think that just anyone could relaunch a site and shoot to the top of the rankings and pick up business-saving traffic levels in a week’s time. I’m sure most SEO experts would agree with this, and would also tell you that anyone who promised such extraordinary results would most likely be scamming you. And no, I’m not trying to suggest that most SEO is so tricky that only experts can pull it off. You can get pretty far in a lot of markets with quality content, and good site navigation and title tags. But in a relatively competitive business like DUI attorneys in a major market, you can expect that a lot of your competition has the basics right. So what else can make the difference in top rankings? The woman in the story, Araceli Parra, states clearly that the site as it existed before her work was a “really bad site” before she fixed it, 2 years ago. The (new) site number1duioffice.com actually looks pretty good to me at a quick glance. It has lots of good content, and the basic SEO seems fine. However, according to a domain check at domaintools the domain has only been in existence for 2 years, , so it is not immediately clear what the bad site was before her work. So we’ll have to dig into that to figure it out. The age of a web site matters alot. Some SEO experts say it’s actually the age of the links in to a site that are the most important, but either way, it’s very difficult to get a new site to rank well for competitive terms. 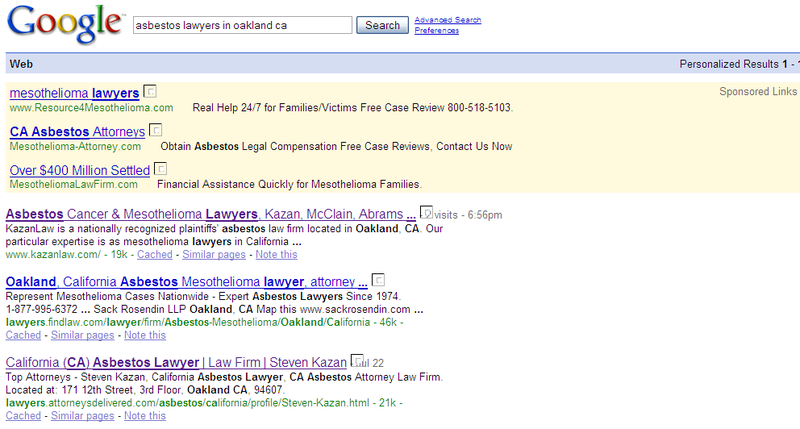 I think it is possible that a two year old site could rank #1 (and #2) for a presumably valuable term like oakland dui lawyer (well done!) as it does now, but I don’t believe that is would happen instantly upon launch, and be sustained for 2 years. There must have been a previous site, or something else going on here. Let’s dig into the links. This is an absolutely key point. So let’s take a cook at these links. I use a paid tool called seoelite, for this purpose but I’m guessing aaron wall’s free backlink tool would be fine too. How can a new site with only a couple of links rank well for these terms? As it turns out, a couple of these links are from sites that are permanently redirected to this new site. A permanent, or 301 redirect, is the search engine friendly way to redirect all the link juice, and authority from an old site to a new site. Aha! We may have found the source of this site’s strength. One of the redirected sites is duioffice.com, which has a decent number of good links, and has been around since 2000. That’s relatively old in the lawyer world, so the redirect from this site is almost certainly a critical source of the new sites power and authority. There is another dui lawyer domain redirected to number1duioffice.com, and also a redirect from a redirect coming in via duioffice.com, so there are a number of things going on here. Just as an aside, I wonder why the bothered to change the primary site from duioffice.com to number1duioffice.com? I probably would have just fixed up duioffice which is a better domain, then having to worry about all the redirecting. But it certainly seems to be working out fine for them. Bad Site? Not So Bad. I could go on into a discussion about the previous site by viewing in on the internet archives, and the short answer is, sure, the old site probably needed a lot of basic optimization. And no doubt the new site and the work that Ms. Parra did was important in getting the value out of that site, and that her new content may well have been critical in getting the most important thing from the web site – phone calls and customers. But the bottom line is that there is no way that any of that would have happened without the well aged, quality “link juice” that came from the original site. She was sitting on a nice oil field, and figured out where to drill, maybe because she was smart enough to realize that, or maybe she just got lucky and had no idea what was even there. This article is somewhat deceptive about the results she achieved, and whether that is really possible in the vast majority of cases. Most people are simply not sitting on an old site with some nice links that is badly optimized. Again, it is perfectly plausible to build a great site with great content, well optimized, get good links, and do extremely well in the medium and long term. It happens all the time. But it is rare and difficult to be an overnight success starting from scratch. Posted by dave on Monday, July 28th, 2008 at 7:59 am and is filed under seo. You can follow any responses to this entry through the RSS 2.0 feed. You can leave a response, or trackback from your own site. Derek at CapeCodSEO writes about the dangers of “free advice” in the SEO world. People tend to obsess over minor details and narrow tactics about what they think their site needs to rank competitively. If you give a tip on one of these tactics, you may be inadvertently misdirecting them to focus on a trivial point to the exclusion of the larger goals. And when it all comes crashing down, you may face blame for that failure. This should be obvious to criminal defense lawyers if you consider the following analogy: Would you give legal advice to someone about a DUI charge, based only on their interpretation of the events? Of course not. Criminal defense attorneys know that a client’s notion of what happened when they were arrested is often grossly misleading, and ultimately not relevant to the goal of a proper legal defense. You need to review the police report and any other evidence before you can hope to offer useful legal advice. Clients who focus on how a cop was “mean” to them need to understand that aggressively taking on a police officer in court is usually not going to win your case. SEO itself is only a tactic to get web traffic in service to the goal of getting more business. Yet, I’ve seen a lot of smart attorneys who know a little bit about SEO techniques do some absolutely crazy and dangerous things with their web sites. Some criminal lawyer sites use on-page tactics that even if they work for rankings improvement, are almost certainly killing conversions and self defeating. And it’s no surprise when the site traffic and rankings plummet. The bottom line is find an expert you trust, in law or SEO, to do a comprehensive assessment of your situation, and understands your goals for big picture. Posted by dave on Tuesday, July 8th, 2008 at 9:43 am and is filed under seo. You can follow any responses to this entry through the RSS 2.0 feed. You can leave a response, or trackback from your own site.